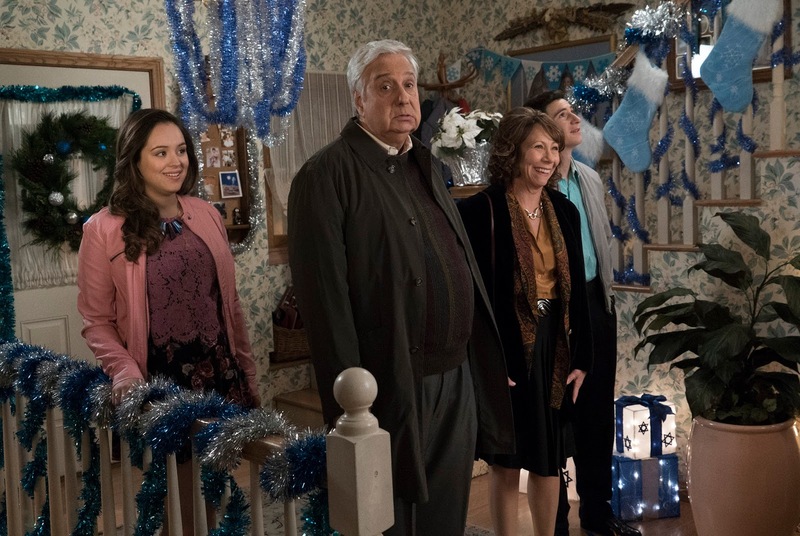 It's Hanukkah on this week's Goldbergs (and in real life), and Beverly starts a Hanukkah war with Jeff's dad. Meanwhile, Adam and Barry worry about who gets to not Start the Fire. Should be a fun one. Adam is obsessed with Billy Joel's (terrible) hit song We Didn't Start the Fire, so Jackie convinces him to perform it at the school's holiday talent show after he serenades her with it. Erica tells Beverly that she's going to spend the first day of Hanukkah (Hanukah? Chanukah?) at Jeff's parents. She's not okay with this and decides to "win" Hanukkah. Barry is shocked that Adam has confidence, and Adam tells him that it's all because of Pops. So he asks Pops for knowledge. Pops decides to take him on, because he's a challenge and he loves a challenge. Hanukkah at the Schwartzes is going really well, but Beverly is getting jealous. She feels crap about herself, and convinces herself that she's going to lose Erica to them. Barry gets advice from Pops, and he decides to sign up for the talent show. Mr. Glascott is super happy and optimistic about the talent show. Adam tries to sign up, but Barry announces that he'll be singing We Didn't Start the Fire at the talent show. Let the war begin. Beverly asks Lou Schwartz to come over for Night 2 of Hanukkah, and she gets Lou to admit that he WAS trying to steal Hanukkah. For once, Beverly was right. This means war, but Beverly's kinda blind right now, so this isn't going to go well. Barry is rehearsing for the talent show, and he's incredibly terrible. Adam loves how bad he is, but Barry's so ignorant he doesn't know why. Beverly went all out for Hanukkah, and has decorated the house beautifully. Lou challenges her to a game of dreidel, and he's confident he'll win. Beverly's just as confident that she'll win. Pops tells Barry to let Adam sing We Didn't Start the Fire, but he suggests that he performs Abbott and Costello's Who's On First. Barry is very confused, and Pops' visual aid doesn't help at all. They finally use a real-life model, but Berry doesn't think it's funny so he tries to change things. Then, Pops tells him he's just trying to save him from himself and tells him that his successful karate routine (from 2013's Kara-te) was actually done through cheating. Beverly and Lou's dreidel competition isn't going well, as she loses Hanukkah. However, they make a new bet and it turns out that he's been cheating. Lou smashes it before she can prove it and then they start yelling at their kids over picking sides. Now everyone's depressed. Adam is finding a new talent show act when Pops comes in to ask him to talk to Barry. He does, and he tells him to perform it with his help. He performs a song inspired by their school, and everyone loves it. And then he starts a literal fire. Lou and Linda come to apologize, and they throw in the towel. They start a new Hanukkah tradition and they decide to share it. I really loved this episode, and it was great to get another Hanukkah episode. This is probably the show's best Hanukkah episode, and it was great to see Jeff's parents on the show. The Lou-Beverly rivalry was incredibly entertaining and I loved the resolution of that plot. Adam and Barry's plot was great too, and I really loved that "Who's On First" was just too complicated for Barry to understand. And as always, it was great to have Jackie back. I do wish that Murray had a bigger role this week, but that's not enough to effect the score. And that's a wrap for the Goldbergs in 2017! The Goldbergs (and I) will be back in January for more hijinks with Beverly, Schmoopie, Barry, Murray, and Erica.